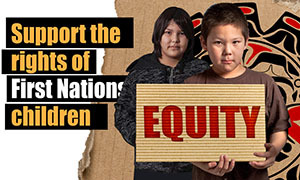 UFCW Canada has launched a new campaign demanding equity for First Nations children in Canada. As part of the campaign, Canada’s leading union is calling on Jane Philpott, the federal Minister of Indigenous Services, to address the flawed delivery and inadequate funding of health care, education, and other social services for First Nations children. It has been 10 years since Cindy Blackstock and the Assembly of First Nations took the federal government to court, citing discrimination against Indigenous children in the delivery of social services and the implementation of Jordan’s Principle. Since then, the government has failed to comply with three non-compliance orders issued by the Canadian Human Rights Tribunal, while refusing to take effective remedial actions at the policy and program levels. As a result, the situation for First Nations children remains grave in many parts of the country. UFCW Canada stands in solidarity with the First Nations Child and Family Caring Society (FNCFCS) in demanding justice for First Nations children in Canada. We encourage you to show your support for Indigenous youth by calling on the federal government to adequately fund health care, education, and other social services for First Nations children, and ensure that these services are delivered in a fair and equitable manner. Pledge your support today by signing the letter below. Tell the federal government that Indigenous children deserve the same access to high quality social services as all other children in Canada. Take action now!